Stuart Hobson Middle School is a public school for 400 5th to 8th graders and is the middle school campus for the Capitol Hill Cluster School in the District of Columbia. Approximately 85% of the students are African American, 10% are White, and 3% are Hispanic. Thirty-nine percent of the students are considered economically disadvantaged. 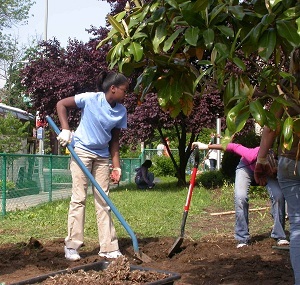 This school is committed to improving its school grounds, and is participating in the Capitol Hill Green Schools Initiative. 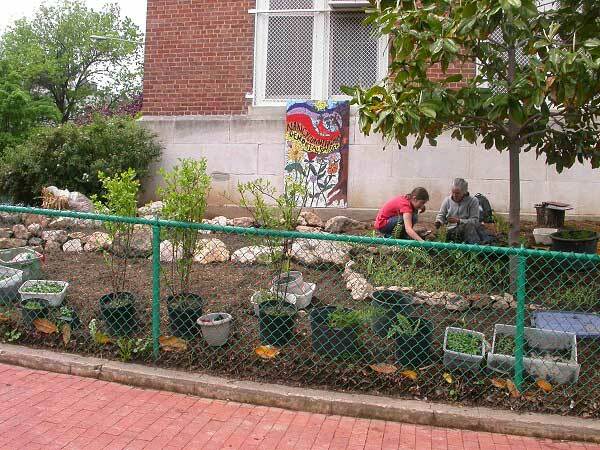 In the spring of 2009, Lands and Waters joined Living Classrooms of the National Capitol Region and the school to initiate the school’s first major schoolyard greening project, the installation of the first phase of the Nancy Cunningham Memorial and Native Plant Garden on the northeast side of the school building. Additional phases will begin 2010 summer. Student planning with Jeanette Stewart on planning day. 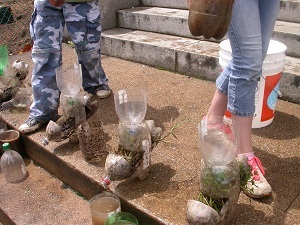 In 2004, LANDS and WATERS introduced the composting curriculum to Kimball's first grade students. Earth Sangha, a strong partner from the very beginning, provides plant, landscaping materials, and consultation for the conservation projects. 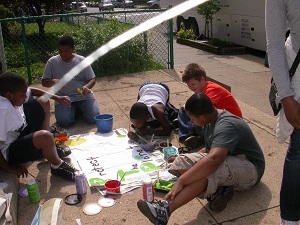 Now in its sixth year, our environmental program reaches all grade levels. In 2008 Living Classrooms of the National Capital Region joined us in bringing hands-on education and conservation projects to Kimball. Let's take a look at some of the aspects of the Kimball Project. 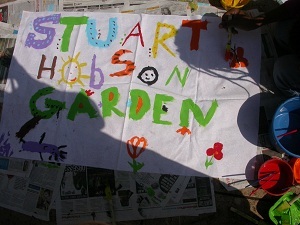 Students creating poster for garden. Students removing turf grass before planting. Educational activity - Erosion in a jar.